An electrodynamic model of a fiber-optic hydrogen sensor is proposed, in which a taper with a nanoscale palladium coating, created in a photonic crystal fiber, is used as the sensing element. 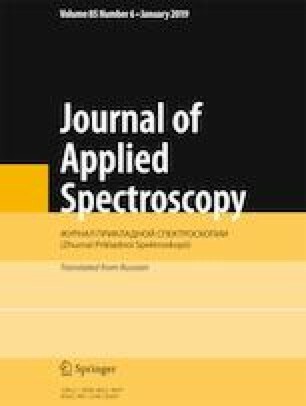 Based on the model, experimental data have been processed for transmission spectra of a taper with an 8-nm-thick palladium coating at various hydrogen concentrations in a nitrogen atmosphere. It was found that an increase in hydrogen concentration leads to an increase in integrated transmission of the sensor and has virtually no effect on the wavelength position of the transmittance interference maxima. The possibilities for optimizing the sensor by choosing a length of the taper waist are determined. Translated from Zhurnal Prikladnoi Spektroskopii, Vol. 86, No. 1, pp. 128–135, January–February 2019.